Planters NUT-rition is a nutty, crunchy mix of your favorite nutritious snacks. Sweet and chewy blueberries, creamy yogurt covered raisins, crunchy almonds, honey roasted peanuts and protein filled granola clusters make these bags of nuts a treat to savor. 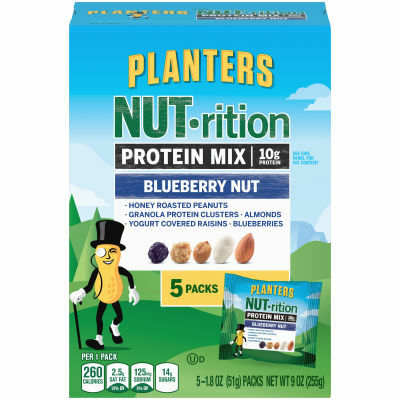 For a mid-day energy kick or quick breakfast on the go, grab a portable pack of Planters NUT-rition Blueberry Nut Protein Mix and experience the benefits of a good source of protein snack.